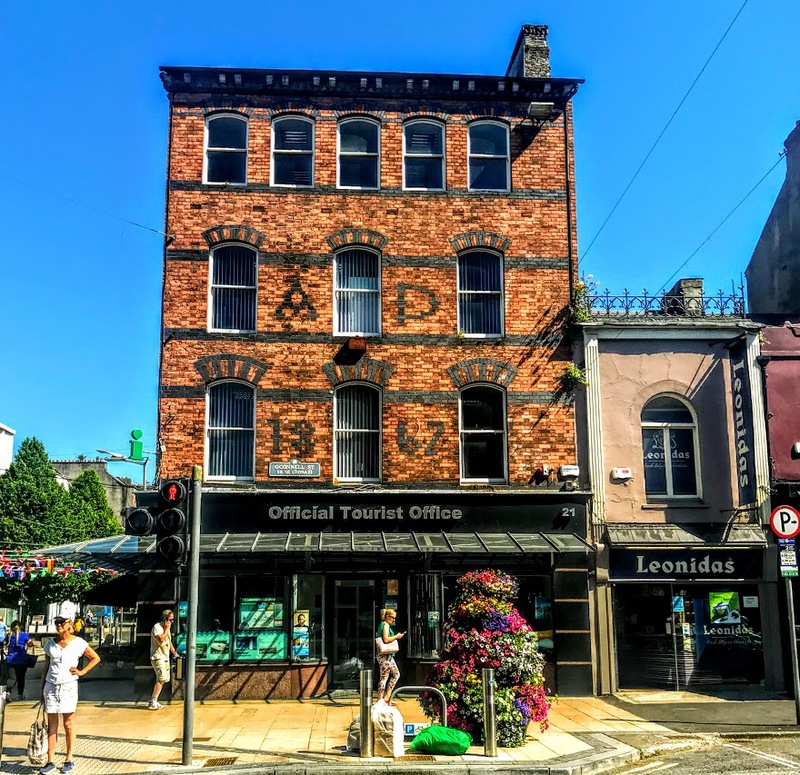 The Official Tourist Office at 20-21 O’Connell Street, Limerick, is part of the Fáilte Ireland tourist office network in Ireland, where staff offer visitors information on places to go, things to do, where to stay, tour bookings and what’s on locally and nationally. 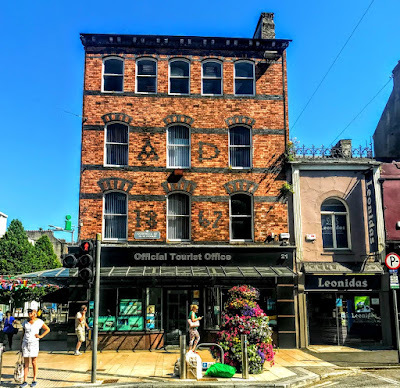 These include places of interest along the Wild Atlantic Way, the treasures in the lakelands and the exciting activities and events in towns and cities. The building stands on the south-east side of O’Connell Street, at the corner of O’Connell Street and Thomas Street. 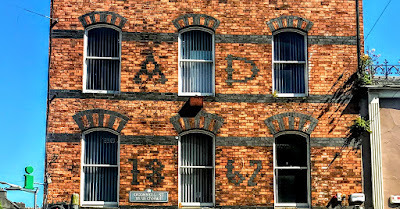 Despite the modern shopfront at the ground floor level, this building is a place of architectural interest in Limerick because of its polychromatic red-brick features, including the vitrified brick lettering with the date AD 1867. This gable-ended, three-bay, four-storey polychromatic red brick building, is dated 1867. The building rises above the buildings beside it with an interesting five-bay third-floor level. The red-brick front elevation is laid in Flemish bond with a diagonal brick cornice and vitrified brick courses at sill levels and at the level of the springing of the first floor window arches. The painted, brick north-facing side elevation has unpainted vitrified brick stringcourses. 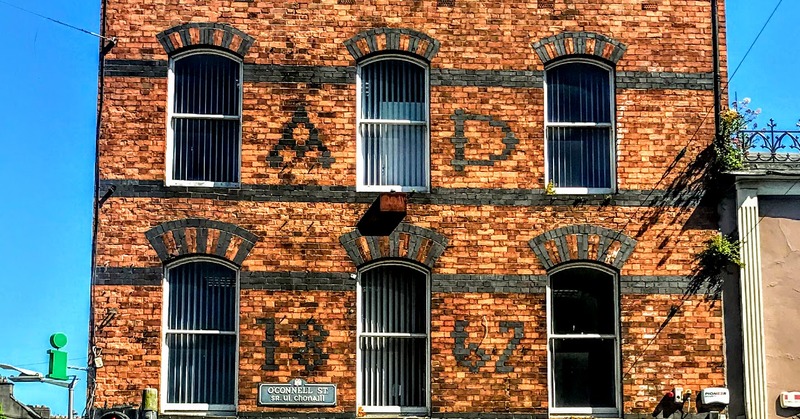 There are segmental-arched window openings with red and vitrified brick arches, red brick reveals, flush vitrified brick sills, and one-over-one timber sash windows with ogee horns. There is a pitched natural slate roof with a large brick chimneystack at the south gable that has a corbelled pointed-arch detail. There are corbelled brick eaves to north gable, and moulded cast-iron rainwater goods on the polychromatic corbelled eaves. The polished granite shopfront dates from around 2000, and has an over-wrought steel-framed glazed canopy. The elegance of this red-brick building makes an interesting contrast with the pretty and diminutive single-bay, two-storey No 22 next door. This is a terraced single-bay, two-storey building, built around 1900. Here fluted full-height pilasters are joined by a plain rendered band at the parapet level, and there is a modern timber shopfront at ground floor level that dates from about 1990. The round-arched window opening has a rendered reveal, painted sill that is possibly replacement, and a 1950s timber casement window. This building has a pitched artificial slate roof that is hidden behind the parapet wall and its cast-iron cresting. I spent much of Thursday [28 June 2018] in Limerick, first at a meeting of charity trustees and then in Saint Mary’s Cathedral to record a Eucharist at which I was the preacher as Precentor. The recorded Eucharist is to be broadcast on RTÉ Radio 1 on Sunday morning 15 July 2018. The Dean of Saint Mary’s, the Very Revd Niall Sloane, presided, the other clergy who too part included the Revd Edna Wakeley and the Revd Paul Fitzpatrick, who is to be licensed as the cathedral curate tomorrow afternoon [30 July 2018], and the choir was directed by Peter Barley. As I was wandering around the cathedral while the choir was rehearsing and others were testing sound levels or putting the finishing touches to their notes, I took a look at what is known as the ‘Leper’s Squint’ in the original north transept or Chapel of the Holy Spirit, which dates from around 1360. The ‘squint’ is hidden to the left and behind the organ, and so visitors often miss this opening in the cathedral wall. 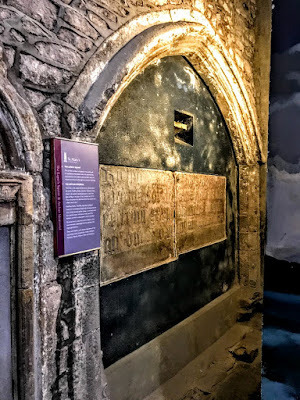 Visitors who see it are often told that the prevailing medical opinion of the day meant lepers were not allowed inside churches in mediaeval times, but could watch celebrations of the Eucharist or the Mass through this opening and also receive the Holy Communion. Leprosy was common in the Middle Ages, when it believed to be highly contagious and therefore Lepers were not allowed into churches. The Cathedral’s ‘leper’s squint’ allowed them to see and hear mass and receive Communion through this small opening or slot to the side of the High Altar. There is a surviving reminder of the prevalence of leprosy in mediaeval Ireland in the name of Leopardstown in suburban south Co Dublin. But was the opening in the original north transept in Saint Mary’s Cathedral, Limerick, truly a ‘leper’s squint’? Openings like this are rare in Irish churches but are found in mediaeval churches throughout Europe. An opening like this is known as a hagioscope, from the Greek words άγιος (ágios, ‘holy’) and σκοπεῖν (skopein, ‘to see’). This architectural term denotes a small splayed opening or tunnel at the eye level of people who are seated so that they can see through the internal masonry of a dividing wall in a church. These openings are usually in an oblique direction, south-east or north-east, to facilitate one or more worshippers in side-chapels, private manorial chapels, chantry chapels at the east ends of the aisles, or other parts of a church. Sometimes, the High Altar in the chancel was not visible, making it difficult to witness the elevation of the host and the chalice after the words of institution. A hagioscope offered a good view of the High Altar to everyone within the sectioned-off area. Perhaps the best-known hagioscope must have been that provided for Julian of Norwich. But Lady Margaret Beaufort, mother of Henry VII and grandmother of Henry VIII, was also provided with her own screen, private viewing facilities that still exist in the Chapel of Christ’s College, Cambridge. However, when a squint was made in the external wall of chapel, church or cathedral, it allowed lepers and other people regarded as non-desirables to watch the liturgy without coming into contact with the rest of the congregation. These squints were often known as leper windows or lynchoscopes. Apart from the blocked-up lepers squint in Saint Mary’s Cathedral, Limerick, Athenry Priory in Co Galway also once had a leper’s squint, and there were leper’s squints or similar stone openings too in Furness Church, a 13th century Norman church near Naas, Co Kildare, and Saint Mary’s Church, Inis Cealtra or Holy Island on Lough Derg. Perhaps the opening in the wall in Saint Mary's Cathedral, Limerick, served a mediaeval hermit, a small community of nuns, or even a rich local merchant or patron with his own private chapel. The obvious family in this case would be the Arthur family, for Canon Geoffrey Arthur, the fifth recorded Treasurer of the Cathedral, was buried here when he died in 1519. A stone slab with his name and a decorated cross is set into the triple arched sedilia recess. But the story of a leper’s squint seems to be more engaging for visitors who manage to find it behind the organ.